I’m not sure if it’s because it’s Fashion Week here in NYC, or because the fall season has begun bringing with it a new crop of looks, or maybe I just hadn’t strolled down Madison Avenue in a while but, when I did yesterday afternoon I was really struck by all the store windows, both in their content and their display design. 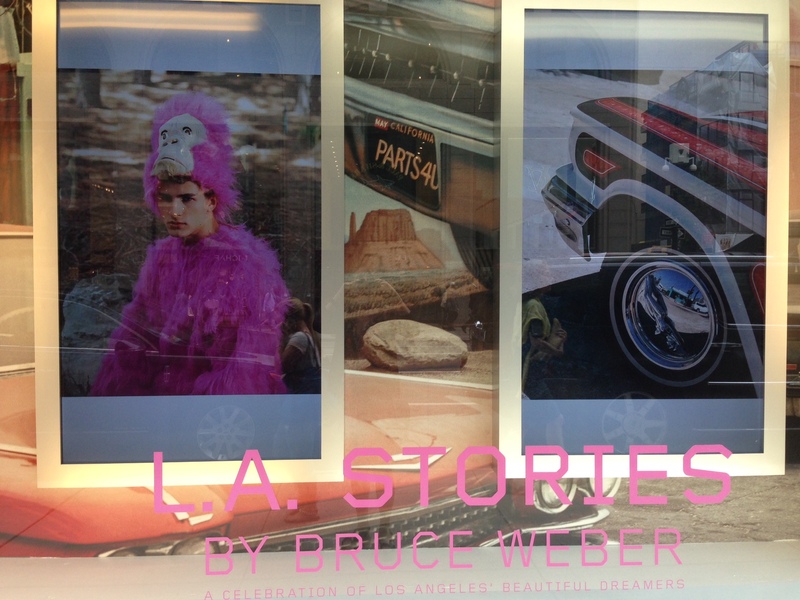 Barney’s had a series of rotating photos by Bruce Weber titled L.A. Stories; another store whose name escapes me was setting up neon signage along with what seemed to be an outdoor runway, but the windows that stopped me in my tracks were those of Hermès. 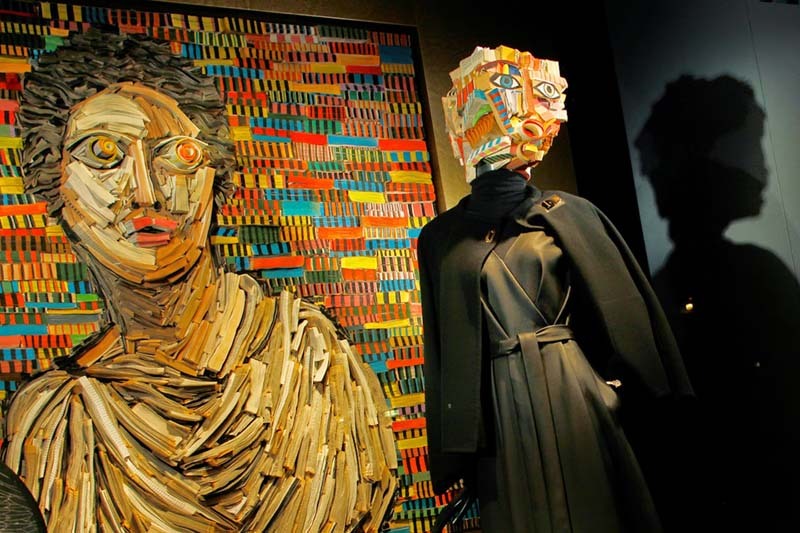 The mannequin heads were these spectacular sculptures which at first glance looked like blocks of painted wood, but as I got closer I realized that they were actually books. Books! Rolled, fanned, stacked, bent, not only were the mannequin heads stunning (possibly the most fabulous part of the general fabulosity), but the backdrops as well were intricate tableaus created using the edges of books, painted in colors and stripes, in some cases just as multicolor striped motif backdrop while in others 2-dimensional mythical gods. 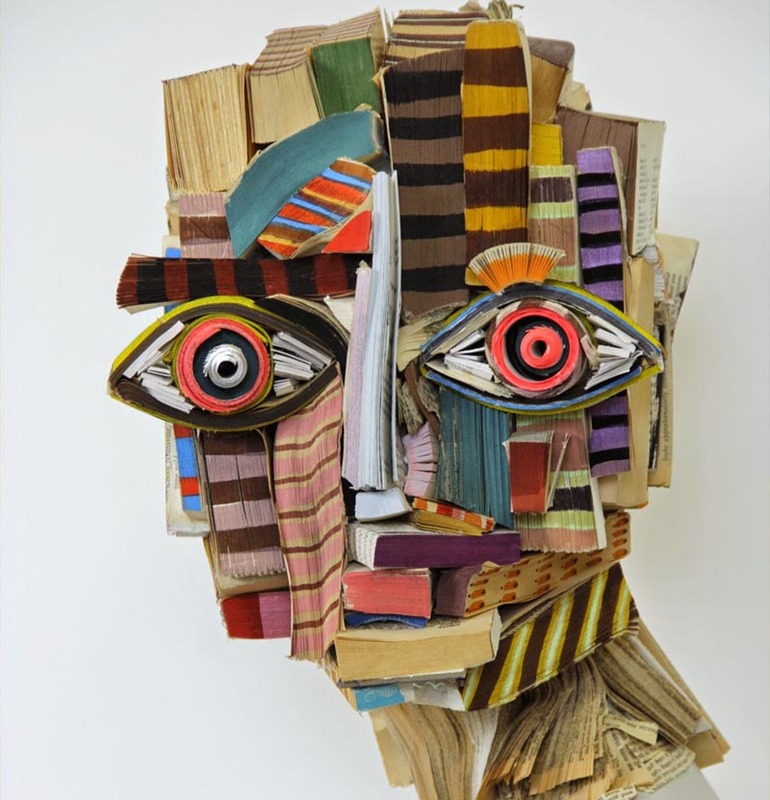 I went in to ask who the artist was and should have recognized the name right away, having posted NYC-born and based artist Nick Georgiou’s work before. Seeing them in person, however, is even more impressive. Kudos to whoever thought to give the job to Georgiou, and of course kudos to the artist himself for making an impressive splash on Upper Mad, specifically at the corner of 62nd Street. Daniela shared this Instagram photo series with me last week and it’s right up our alley, both because they’re absurd—starting with the title—and because they’re pizza-related, two things we really enjoy. 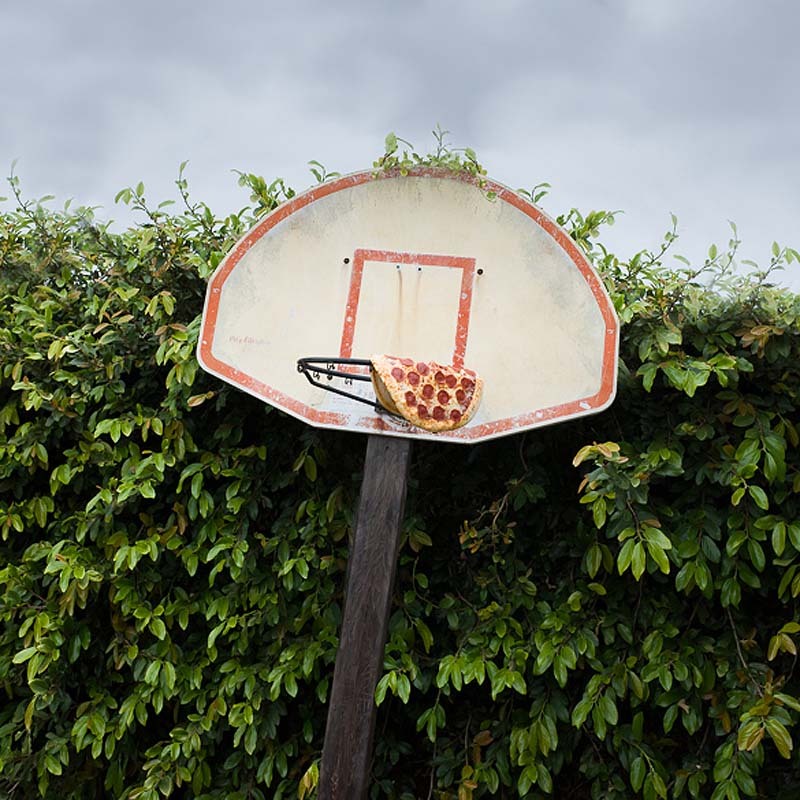 Pizza in the Wild series I and II by Los Angeles-based photographer Jonpaul Douglass were inspired by pizza graffiti which led him to photograph a bunch of Little Caesar’s pizza pies in unusual locations and situations throughout LA. Some hang off ledges, others are thrown/placed on animals, cars, street signs and the like, and still others become one with nature. 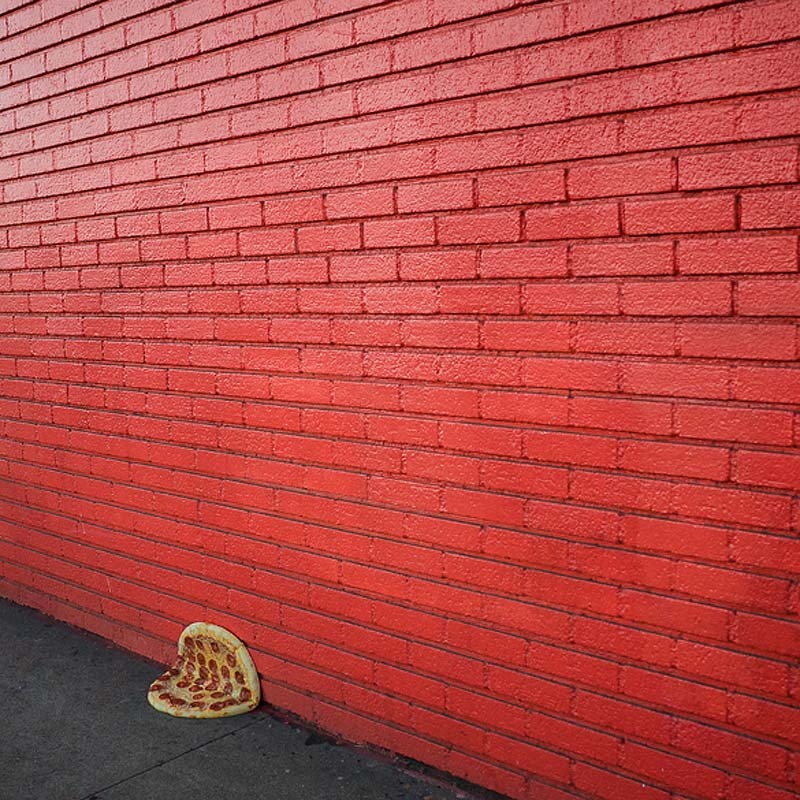 If you’re feeling badly for the pizzas that appear in the shots, don’t; none were harmed in the making of the series and apparently some were even eaten! A very wise man, for sure. Look up New York! 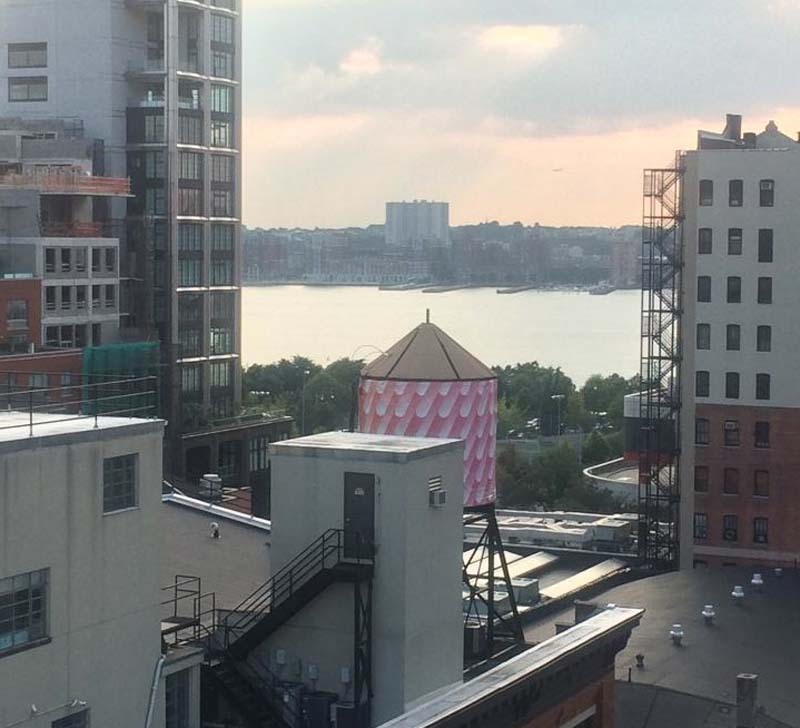 The Water Tank Project has started to roll out…or maybe “wrap around” would be more accurate. I first learned of Word Above the Street’s project roughly one year ago, but was happy to hear yesterday, via an interview on wnyc, that this is actually taking place right now. Filmmaker Mary Jordan, the creative and driving force behind the project, was working on a documentary in Ethiopia in 2007 when she fell gravely ill due to contaminated water. It was the women in the village she was in who nursed her back to health. In return, they asked that she let people know of the global water crisis when she returned to the U.S. Jordan founded Word Above the Street and set out to fulfill her promise through a citywide exhibit on the very icons that proudly contain our own fortunate and excellent water supply. 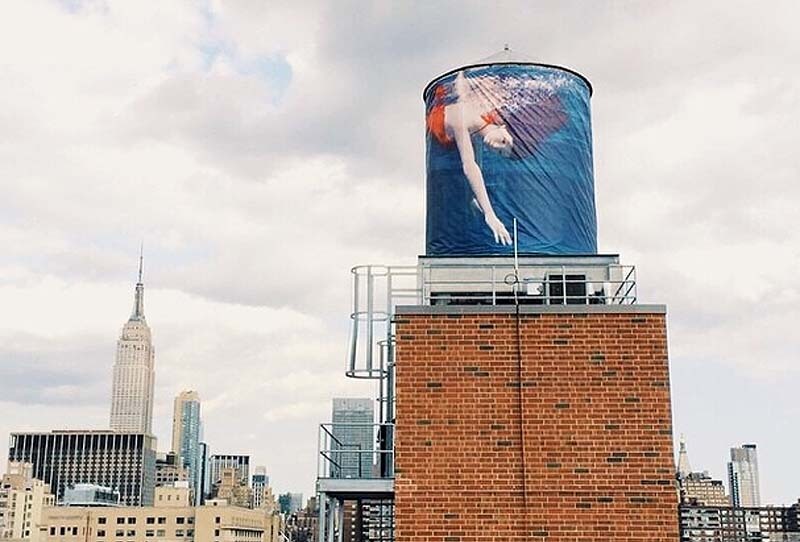 Over 100 water tanks will be wrapped with art by acclaimed artists (such as John Baldessari, Jeff Koons, Maya Lin, Andy Goldsworthy), street artists (including Icy & Sot, Barry McGee, and Fab 5 Freddy), emerging artists, and even NYC public school students. The first one, by Laurie Simmons (top photo), went up two weeks ago on 29th Street near the High Line, and another one (I couldn’t find the artist, but third photo down) on West 25th Street. 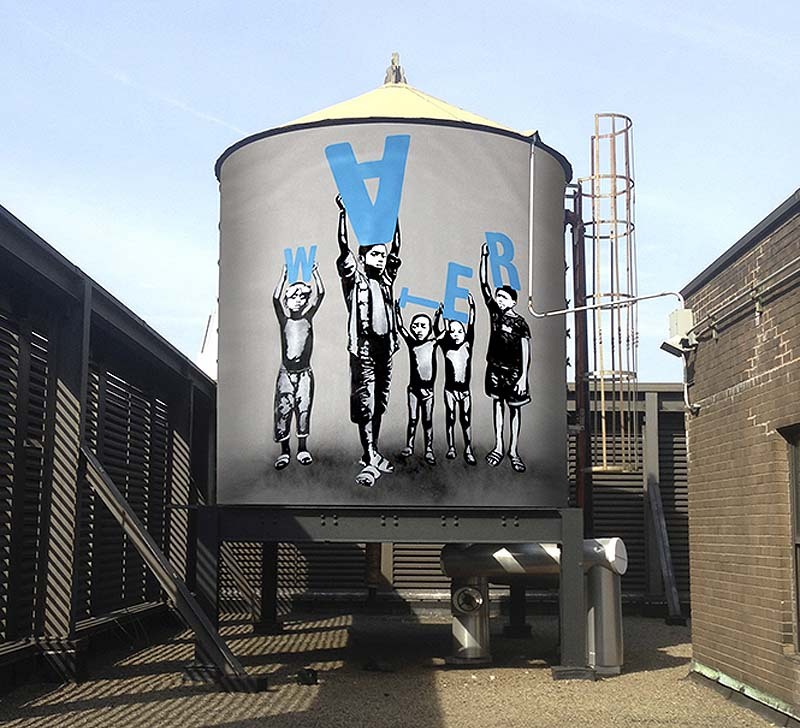 Tanks in all five boroughs will be included and, in addition to the art above, action will be taken on the ground through educational programs, tours, and a symposium dedicated to global water issues. So, keep your head up and eyes peeled for the next 3 months if in NYC. Or, if not, you can always follow them on twitter or instagram for the latest updates. Water above all! 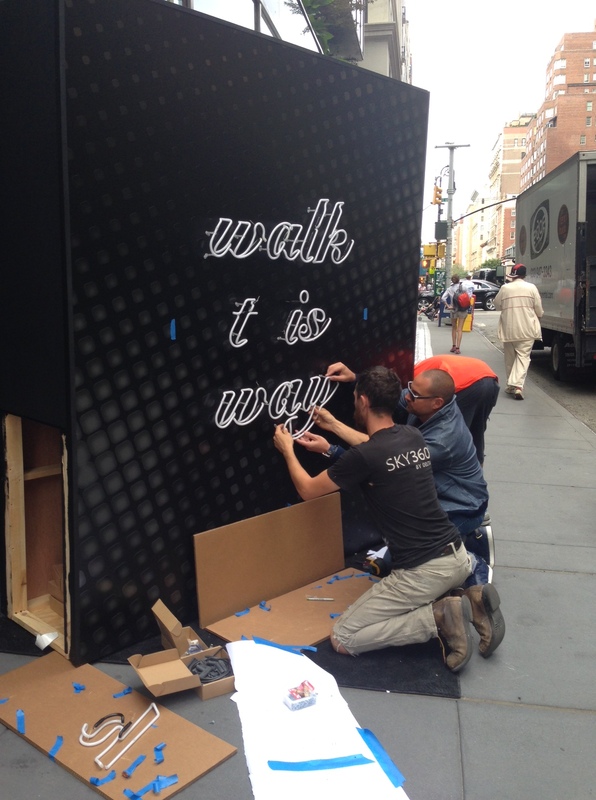 I noticed a few of these in Nolita the other day and then again yesterday right around Astor Place. 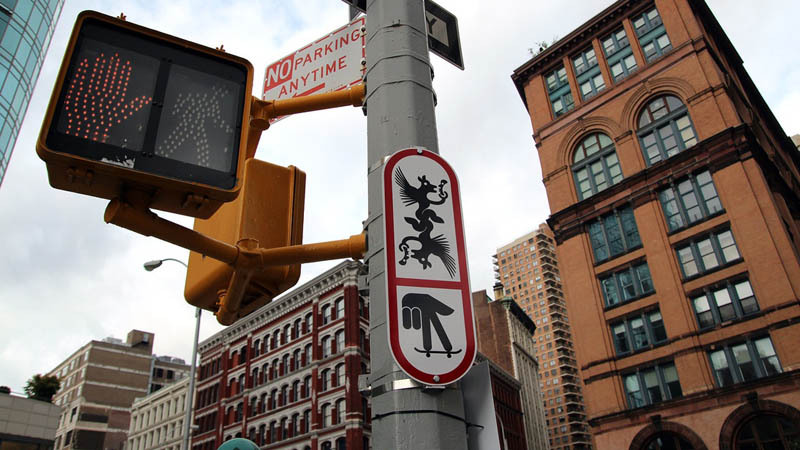 I wondered what they were about and have since learned that it’s a public art project titled Signs by artist/designer Ryan McGinness fabricated and installed by NYC Department of Transportation (DOT). Apparently there are fifty in all of these vinyl on aluminum signs and, so far, they seem to mostly be downtown. McGinness has sketches of all fifty on his website accompanied by brief, somewhat whimsical/enigmatic descriptions. I couldn’t find more information, such as how the DOT went along with this, but I’m a fan of anything that makes you stop on the busy streets of NYC and ponder. 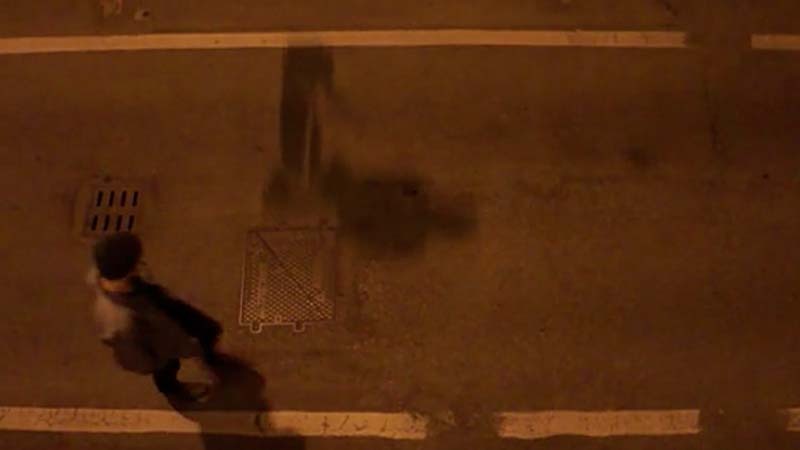 If you’re in the city, keep your eyes open for more of these. They’re scheduled to be up through August. Top photo: Ryan McGinness; 2nd photo down: Animal; following three photos: DustyRebel. 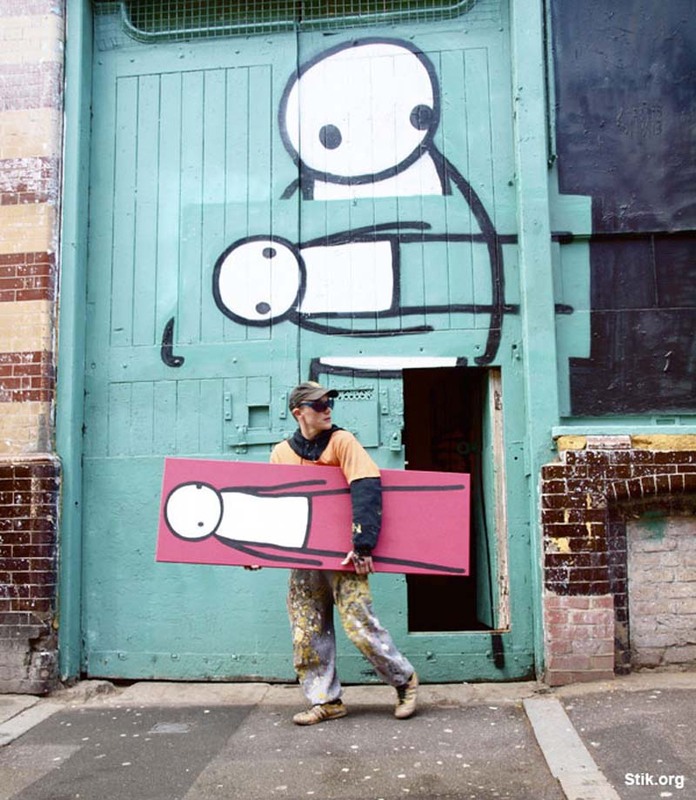 When it comes to street art, it doesn’t get much cuter than Stik. 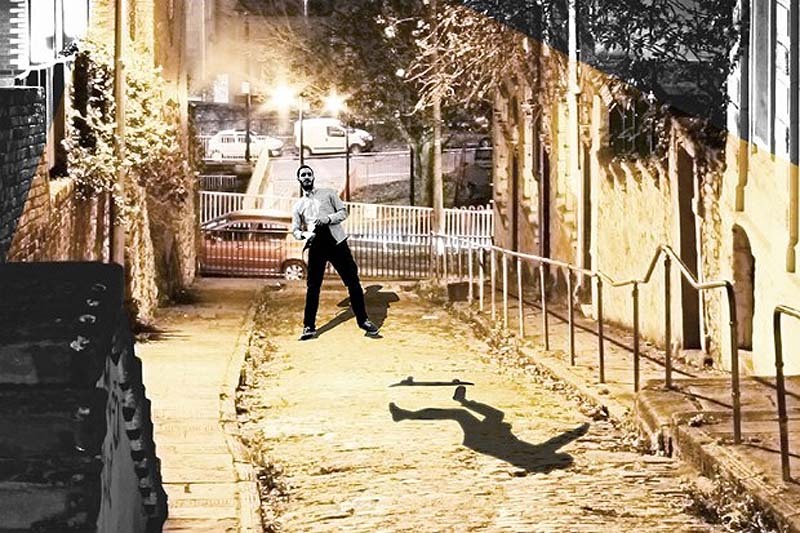 The British graffiti artist based in London paints mouthless and noseless stick figure characters on walls, doors, water towers, and more, that despite their minimalistic quality exude warmth and charm. Sometimes in groups holding hands (see the two water towers we’re acquainted with in the East Village and Bushwick), and other times alone, these not-so-little guys are usually painted in black and white against solid bright colored backgrounds. 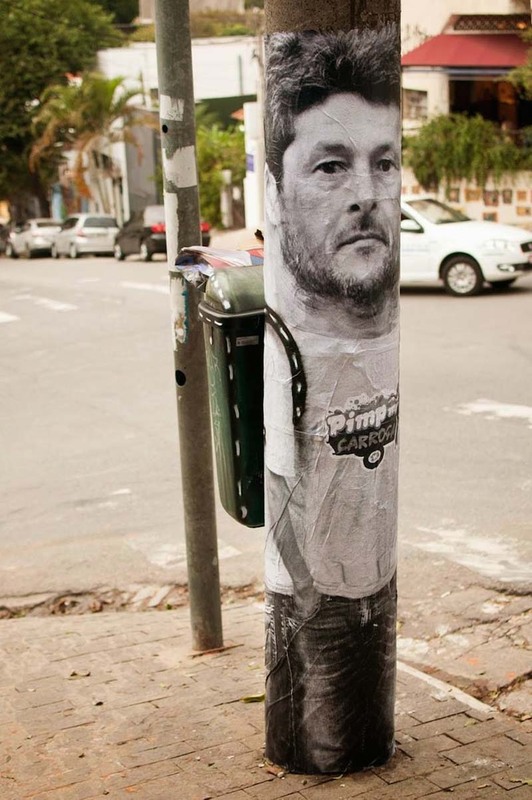 In addition to his unauthorized work, the somewhat private Stik, who has been homeless at times, works with many charitable and human rights organizations. See? That good heartedness shines through in his art. 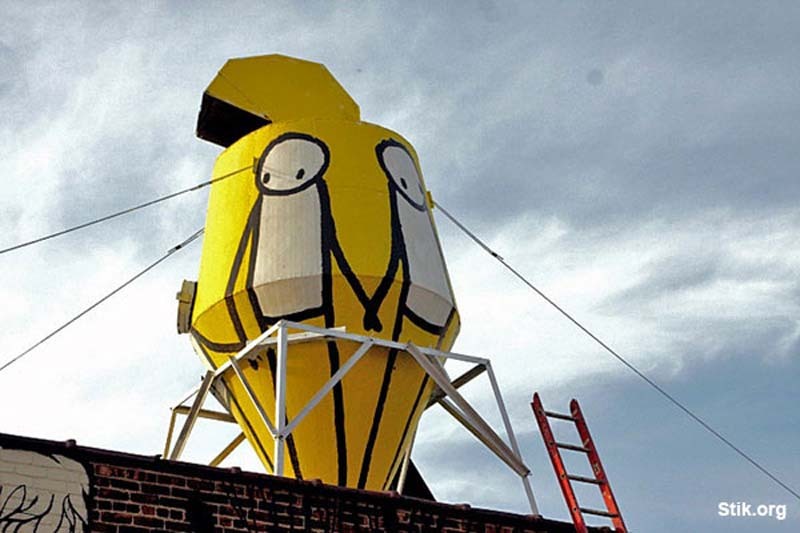 Stik’s work can be seen in Europe, NYC, and even the Middle East and Japan. We are fortunate to have two of his works right in our neighborhood. 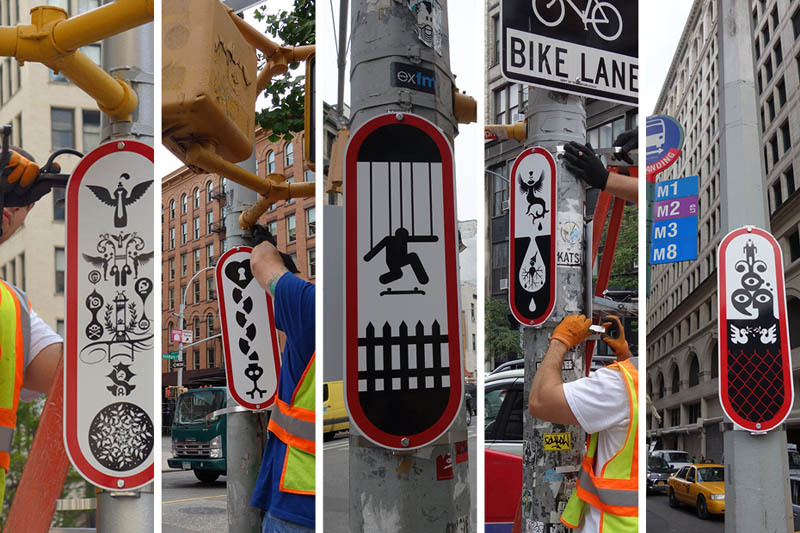 All images courtesy of Stik except bottom left: Geof Hargadon via Brooklyn Street Art, and bottom right: Paul Whitehouse via Huffington Post London. 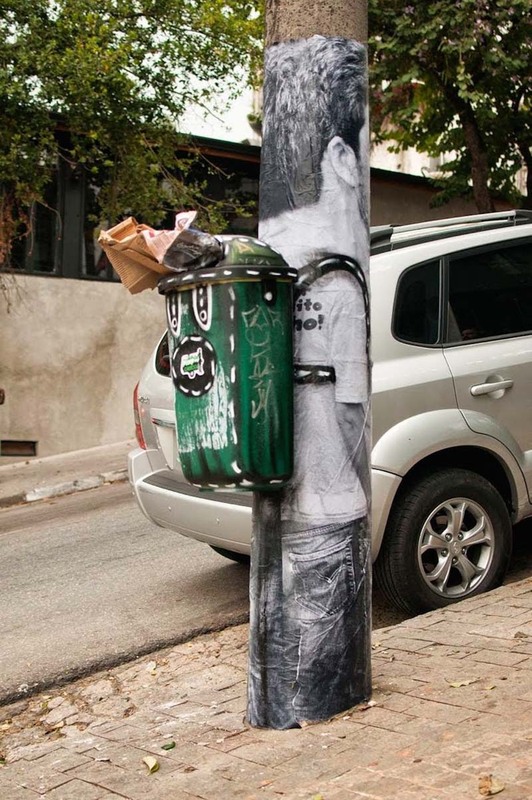 The German street art trio Mentalgassi (previously here) joined forces with Mundano in São Paulo, Brazil, to create this clever series of characters donning their customized trash backpacks for Pimp My Carroça, an environmental and cultural group that aims to add a little color and humor to the importance of recycling and not littering. The message is particularly on point with the hoards of tourists in town for the World Cup, leaving a trail of garbage behind.